Baby, if you've ever wondered, wondered whatever became of Me... Wonder no more, WKRP in Cincinnati is coming to The MeTV Network starting Monday, April 2, 2018! The sitcom will air weeknights at 9:30PM ET. More info is still to come, along with the rest of the network's line-up come April 2, but you can expect WKRP every weeknight at the very least. 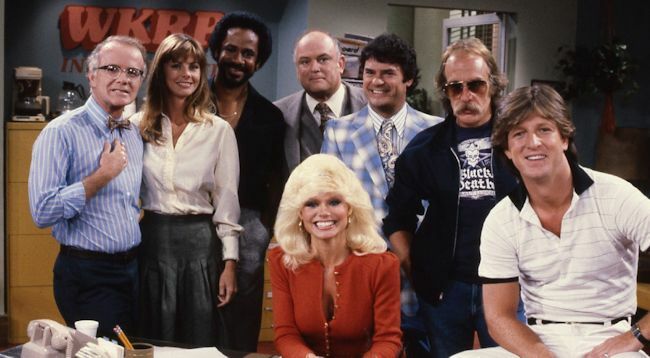 WKRP in Cincinnati was last seen on Antenna TV for a few years starting in April 2012, so now MeTV will be the new home for the gang at WKRP. The sitcom is about the misadventures of the staff of a struggling radio station in Cincinnati, Ohio. Among the stars on the series are Gary Sandy, Howard Hesseman, Gordon Jump, Loni Anderson, Jan Smithers and Tim Reid. Stay with us for continued updates on this story and all things MeTV. Patience is a virtue, but rest easy knowing there is more Black Mirror on the way. Netflix on Monday announced that its utterly addictive, Emmy Award-winning anthology series has been renewed for a much-anticipated Season 5. Black Mirror is an anthology series that taps into our collective unease with the modern world, with each stand-alone episode a sharp, suspenseful tale exploring themes of contemporary techno-paranoia leading to an unforgettable - and sometimes unsettling - conclusion. Without questioning it, technology has transformed all aspects of our lives; in every home; on every desk; in every palm - a plasma screen; a monitor; a Smartphone - a Black Mirror reflecting our 21st Century existence back at us. The series is created and written by Charlie Brooker, and executive produced by Brooker and Annabel Jones.